Are you frustrated by lawn mowing services of other lawn care companies? If yes, then don’t worry and simply turn to GoMow. GoMow specializes in professional lawn care & Maintenance service for Allen Texas areas. Call us today at 800-601-0669 & get a quick free quote. Residential Lawn Mowing in Allen, "You Click,We Cut"
If you are looking for lawn service in Allen TX, you are at right place. Yes, we are mowing on your street! GoMow is honored to offer lawn care and lawn mowing services to Allen Residents. We are the most trusted lawn mowing service company in Allen, TX areas. Click here gomow.com to select from one of the many different lawn maintenance service plans available to the residents of Allen and have GoMow maintain your lawn Today! 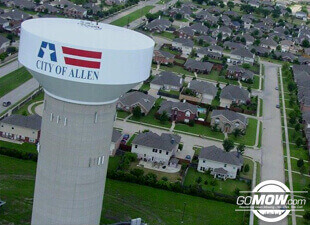 Since being incorporated in 1953, the city of Allen has grown substantially to a population of 99,000 residents and continues to expand each year. The North Texas city now is home to 18 elementary schools, 3 middle schools and 1 high school. Along with a growing and thriving population in an active suburban area, come very busy families. Hectic schedules often leave homeowners with little time left in the day for yard work. The task of maintaining the lawn can quickly be pushed to the bottom of the list. That is where GoMow can help! You just need to Call GoMow 800-601-0669 and a get a quick FREE QUOTE for your lawn care. Contact Lawn Care Company in Texas to help you get set up on an ongoing lawn maintenance and lawn care Allen TX today.